When Mega Man jumps, he jumps for joy. His arms splay out at 10 and 2 o’clock, he emits a shout, and his legs flail. Or so I imagine. Mega Man’s leap is just one frame of animation (two if you happen to fire a shot in midair), but as it traces across the screen in a high arc, triggered by your button press, that single frame carries an outsized exuberance. The end of each stage in a Mega Man game has a gate that opens into the boss chamber; it has become tradition to jump through that door, freezing the hero in his “Let’s go!” pose as the final battle comes into view. In video game graphics, “sprite” is the technical term for a 2-D object that can move around the screen independently of its background. It’s the digital equivalent to the traditional animation practice of laying transparent cels over scenery. (Computers are as lazy as people: They would rather not redraw the whole scene for every frame.) The image of Mega Man jumping is one “sprite”; he also has sprites for running, shooting, and so on. By moving and rapidly swapping out these various sprites, games create the illusion of a continuously animated character. We take it for granted now, but in the mid-’70s, it was a technological challenge to make a computer track and render the movement of small visual objects without recalculating the whole image in memory. Texas Instruments was among the first chip fabricators to figure it out, and when T.I. technicians needed a word to describe the little pictures that were given life by their TMS9918 Video Display Controller, they coined the term “sprites.” Engineers can be poets. Like the fairies that are their namesake, video game sprites exist between the corporeal and non-corporeal realm. In one sense, they’re cartoon characters. Mega Man’s look of childlike excitement even has its roots in Astro Boy, the manga and anime icon that Mega Man designer Keiji Inafune used as an inspiration. But for the player, watching Mega Man jump is a different experience from watching Astro Boy jump, for the simple reason that Mega Man leaps only when you tell him to do so. He’s not merely the object of your gaze. He’s a surrogate body, an avatar of your intentions. So when he takes to the air, it feels a bit like you are, too. But not all jumps are equal. Mega Man has limbs jutting out at every angle, but Simon Belmont, the hero of Castlevania, scrunches into a comically tight ball when he’s in the air. (There’s a practical reason for this: Simon’s “jump” sprite also serves as his “kneel” sprite.) He’s practically a projectile, and that’s fitting. While Mega Man can change direction in the middle of a jump, Simon can’t—he has too much respect for the laws of physics. Castlevania and Mega Man are superficially similar games—side-scrolling platformers in which a hero fights a stream of enemies that emerge from offscreen. Yet they have distinct rhythms, a difference hinted at in their sprites. In Mega Man, you fire a pellet gun with ammunition that travels all the way across the screen. So the game’s outgoing portrayal of your character invites you to constantly send energy outward, because if you can damage a foe from a distance, you’re that much safer. Castlevania’s attacks, conversely, center on a whip with limited range (which is complemented by limited-use special weapons like flying axes and boomerangs). This design choice creates a natural suspense: You have to wait until the ghouls are nearly upon you before you can whip them. 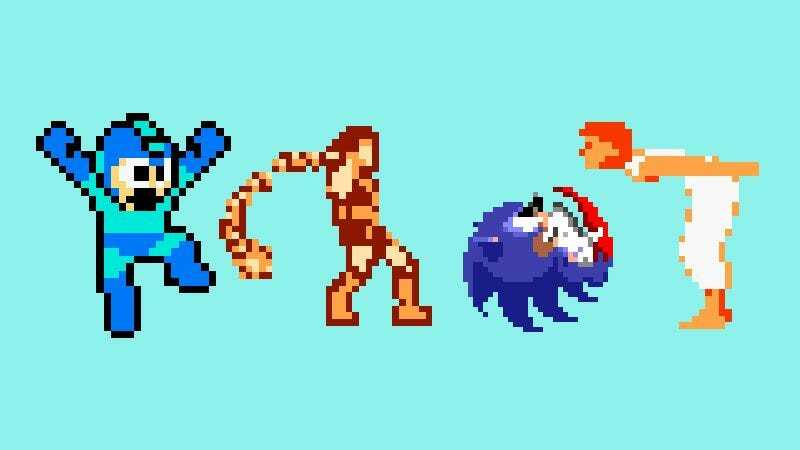 Just as Mega Man’s joyous jump sprite echoes the perpetual explosiveness of its action, the compression and extension of Simon’s sprites reflect the cobra-strike rhythm of Castlevania’s default attack. The tiny images are a microcosm of their respective games’ designs. Sonic The Hedgehog is about speed, but the thing is, if you were going fast all the time, it wouldn’t be much of a game. The high-speed portions of Sonic are also the moments when the player has the least control. There’s not much to do but hold on tight when Sonic launches off a ramp at a scenery-blurring clip. So to maintain the sensation of speed, the designers needed a way to convey the illusion of velocity even when Sonic isn’t breaking the sound barrier. One solution was to make Sonic spin. The varied spin is not only a quasi-realistic design choice—a simplified conservation of momentum—but it’s also a strong motivator. Slow-spinning Sonic doesn’t look or feel as “right” as fast-spinning Sonic. It doesn’t seem that a hedgehog, even a superpowered cartoon hedgehog, could spin that slowly without the motion petering out. But fast-spinning Sonic feels awesome, like you’re at the controls of a little blue dynamo. The kinesthetics of the sprites subconsciously nudge you to prefer speed over careful advancement, which makes players tend to go faster, which makes Sonic The Hedgehog seem like a faster game on the whole. The effect can be startling for players accustomed to the jumps of a typical platformer. Rather than instantly launching into the air when you press the jump button, Prince Of Persia’s hero has to wind up his body for a moment when he leaps from a standstill, just like a real person would. To be any good at Prince, you have to account for this delay and work the distinct jumping rhythm into your muscle memory. That’s the beauty of this sprite: It made millions of players learn how to jump around like Jordan Mechner’s little brother. The kid may not have contributed a single line of programming code, but his genetic code suffuses Prince. By playing and mastering the game, our brains were subtly rewired to store the mechanics of David Mechner’s jumping motion. How creepy, and how cool: the sprite as virus, with the power to infect us all.